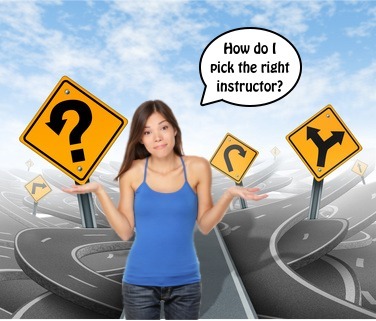 Do you know how to pick the right instructor? We created this list about what to look for when choosing an instructor to make the decision easier for you. What kind of teaching style suits you best? Do you do better with a softer and more gentle approach to teaching, or one more firm and disciplined? Make sure to chat to your potential instructors and find out if their teaching styles suit you. You want to create the best possible conditions for you to learn, and being taught in the right style goes a long way towards that. You should look into whether your instructor has any referrals – if people are happy enough with a service that they go out of their way to give positive feedback, this is generally an indication of a good instructor. Our site allows users to give feedback on instructors, so you’ll be able to see the reviews of potential teachers. One of the most important things is to make sure that your driving instructor is qualified, as stipulated by law (Act 93 of 1996, Section 28(2)). Make sure that they have a valid Instructor’s Certificate (they are valid for 1 year, so make sure they are up-to-date). Ask an instructor to produce their certificate as well as a valid driver’s licence. If the instructor is a member of SAIDI and has maintained a good relationship with the organisation, you are getting a good indication that they are in compliance with the law and are a qualified instructor. Make sure that it’s possible for you and your instructor to have good communication. It is essential when assessing how your lessons are going, and where you need to improve, or where your instructor may need to improve. If you are concerned about anything relating to your lessons, make sure you feel comfortable enough to bring this up with your instructor. You need to be comfortable in your instructor’s presence and have a good rapport with them. You also need to ensure that you trust this person enough to be out driving with them. Your safety is a major priority, and you should not go anywhere with someone you do not feel safe with, especially in a potentially stressful situation like learning to drive. Keep the lines of communication open – you could choose to bring any discomfort up with your instructor, letting them know if they are making you feel uncomfortable in any way. (The same goes for the instructor however – they are not going to stand for harassment or uncomfortable actions either.) If the situation does not improve, don’t be afraid to find a new instructor. It might be wise to book only 1 or 2 lessons to begin with to test how well you get along with your instructor before booking a block of lessons in advance. Talk to your instructor about all of your potential payment options in advance.